A simple enough cache, however getting to it will require some form of watercraft, hence the T5 rating. From the area around the launch point (which is ideal for picnics) you can see Danesfield House which housed RAF Medmenham during the war. The staff specialised in photographic intelligence and developed a technique involving stereo images which helped better identify targets on the ground. Their work contributed to the dambusters raids as well as against V2 rocket sites. The cache is located at head height (to someone sat in a canoe) in a recently cut tree and is attached by wire around a small branch. The cache is located near to the waters edge - i.e. it is not deep under the tree canopy. On the day I placed the cache there were many forms of transport along this stretch of river including people standing on surfboards and paddling. 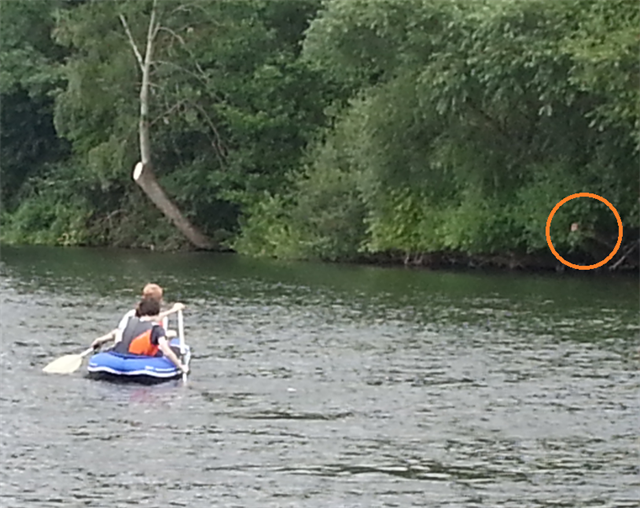 By all means upload pictures of you splashing about on the river. See the gallery for an image showing the approximate location of the cache. (Note: I nearly set a puzzle based upon sterographic images, but I know how many people struggle with these, so feeling generous, I decided to keep it simple).